Sauvignon Blanc Semillon by Sandalford of Margaret River. Sauvignon exudes gooseberry and grassiness, Semillon fills out the palate with weight, texture and citrus nuances. Sandalford spare no expense from vineyard through to bottling, ensuring that their Reserve range of wines are regional benchmarks in their own right. All Sandalford wines are made by the same exacting standards and attention to detail, small batch processing of the best fruit is the cornerstone of the estate's reserve range. A light to medium bodied wine with beautiful balance in respect of acidity giving a lovely zestiness to the finish, a touch of minerality adding to the overall allure. Sandalford Wines is unquestionably WA's leading Wine Tourism facility, recognised by multiple awards for the commitment to wine tourism. Sandalford's tourism hospitality facilities extend to the Margaret River Estate, set amongst beautiful garden setting and south-west bushland. This estate boasts a charming, rustic, rammed earth cellar, free picnic and BBQ facilities and of course, purchasing and sampling Sandalford's wines. Sandalford hosts a range of indoor and outdoor events, from the popular wine maker's dinner to the pinnacle event, the Symphony at Sandalford. The annual Symphony at Sandalford boasts world class entertainment, showcasing major international acts teamed together with orchestral backing. Outdoor concerts exemplify the powerful combination of food, wine and music in the picturesque surroundings of one of the states oldest wineries. In 1972 Sandalford developed a major vineyard in Margaret River. This coastal region in Western Australia's south-west is a premium Australian grape growing area and the Margaret River vineyard is Sandalford's largest source of grapes. This vineyard is now not only one of the oldest, but also one the largest, covering 600 acres. 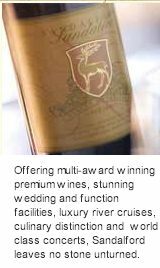 Sandalford's award-winning wines reflect contemporary wine making and include a Premium Collection and the popular Element Range. Recent modernisation increased Sandalford's capacity to almost one million litres in French and American Oak barrels and 600 square metres of underground storage. These state-of-the-art facilities permit custom requests of maturation stock. After a brief period of overseas ownership, proprietors Peter and Debra Prendiville acquired the operation in 1991. An enthusiastic team of professionals are now actively managing an ongoing multi-million dollar redevelopment of both the winery and the vineyard. Under their guidance, Sandalford produces exceptional quality premium wines, available in more than 35 countries around the world and offers visitors to it's Swan Valley winery a world class wine tourism, hospitality and education facility. 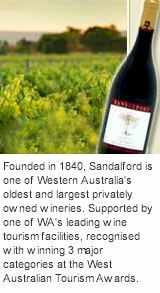 Sandalford has made wines for over 150 years, changing their style and vinification in many ways. Winemaking however has been around for thousands of years so in some sense little has changed. Sandalford is Western Australia's first winery to utilise an artificial wetland concept for the treatment of all winery liquid waste. After treatment, the quality of this resource is such that it is used to irrigate the gardens and lawn areas which surround the winery environs. The system is licensed by the Department of Environmental Protection - Waters and Rivers Commission. Today the winery oversees two prestigious vineyards, one in the famed Wilyabrup region of Margaret River and the other in the Swan Valley. Nothing makes as much sense as aspiring to produce outstanding wine, achieving this goal must then be a source of enormous satisfaction. The wine making team at Sandalford should then be well satisfied with the unrelenting lineage of impressive releases. Sandalford Wines now essentially produce three ranges of wine, the entry point Element range, the ever classic premium Sandalford range and the super premium Prendiville Reserve. All wines are made by the same exacting standards and attention to detail. Significant changes to the winery over the past ten years reflect modern practices, yet maintain the tradition and mystique behind the winemaking process. Whilst Sandalford use the latest equipment for processing fruit during vintage, Sandalford maintains small batch processing of all fruit and use only the top quality French and American small Oak barrels.